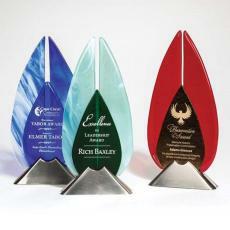 The Eternal Flame, the fire of passion, the warmth and practical help from a fire: all of these feelings can be embodied in flame trophies as recognition awards. It is the perfect acknowledgement for a high-flying salesperson, a leader who has brought a difficult project in on time or an employee who is retiring after many years with the company. 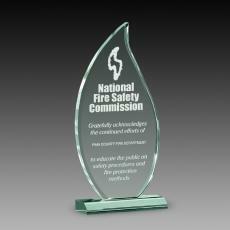 Flame awards are highly prized by their recipients. 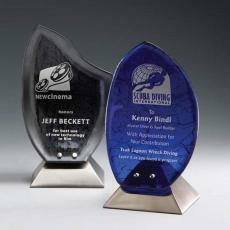 They come in a wide choice of materials, sizes, shapes and designs. Consider a crystal flame with a cobalt or ruby tint. Or a magical glass sculpture in the form of a flame, colored in red and sitting on a wood base. 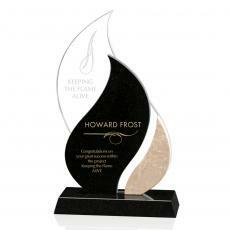 You can choose a triple flame sculpture made of glass on a wood or metal base. 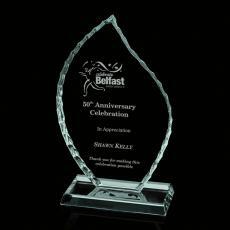 Acrylic flames are affordable and attractive, available as sculptures or as a plaque with the flame engraved. 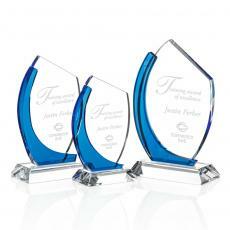 Personalize flame awards give it special meaning for the recipient. 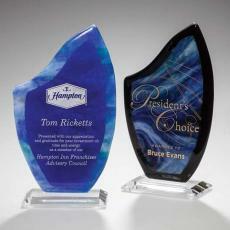 It can sit proudly on a desk or shelf, an attractive way to show the world that the efforts of the person receiving it have been recognized by his peers. $225| Sizes: 5.75"x10.75" & 6.5"x10.75"
$58 - $82| Sizes: 7.25", 8" & 8.75"
$96 - $122| Sizes: 4.5"x8", 5"x9" & 5.5"x10"
$68 - $149| Sizes: 5"x7.75", 6"x8.75" & 6.5"x10"
$85 - $145| Sizes: 5"x7.5", 5.5"x8.75" & 6"x10"
$95 - $135| Sizes: 4.5"x5.75", 5"x6.5" & 5.75"x7.25"
$95 - $145| Sizes: 5.25"x8", 6.25"x9.5" & 7.25"x11"
$125 - $225| Sizes: 3.5"x6.5", 5"x8.5" & 6.5"x10.5"
$295 - $355| Sizes: 4"x12.5", 4"x14.5" & 4"x16.5"
$285 - $365| Sizes: 3.75"x10", 4.5"x12" & 5"x14"